Hey Chicago, bathroom remodeling can be a stressful thing. Let us help alleviate your anxiety by answering a question that our clients ask frequently: what does it cost to design a bathroom here in the Windy City? The key to the cost of a bathroom remodel is knowing three essential things: where you’re starting, where you are, and what you want. Most bathroom remodels start in a bathroom with basic plumbing, heating, and electrical in the existing space. This is very different from converting a closet or the corner of a basement bedroom into a bathroom where walls need to be built and all of the aforementioned items have to be roughed in. Most bathrooms start with the rough locations in place. That means they have sinks, toilets, tubs and/or showers that are ready to be removed and replaced. Electrical outlets, lighting fixtures, fans, radiators, and vents are all usually in place – as are four walls. The question is: what stays and what goes? Old plaster walls may be cracking and require total reworking. Some fixtures may be in good condition but are too outdated to fit in with a new bathroom. Pricing in a small Iowa town is entirely different than pricing in Downtown Chicago. 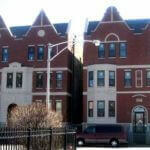 Contracting prices are less expensive in small communities. 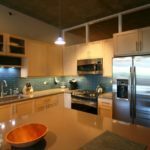 Chicago interior designers are accustomed to dealing with high rise buildings where all materials have be loaded up elevators, working hours are restricted, shut-offs of the water supply may be necessary, and plumbing requires copper and cast iron waste pipes instead of less expensive PVC. This is probably the largest determinant of price. Relocating fixtures adds expense, while keeping tubs or toilets can reduce costs. Shower fixtures can cost $200 or $2000, so your taste is a ig factor. The same applies to tiles, vanities, lights, and everything else in your new bathroom. Quantity and size affect cost as well. A small guest bathroom usually has about 100 to 110 square feet of tile, but if all the walls are covered with tile from floor to ceiling, that will double the quantity and the cost. To help illustrate how style can affect the price of a bathroom remodel, we’ve gathered four examples of what you might want. 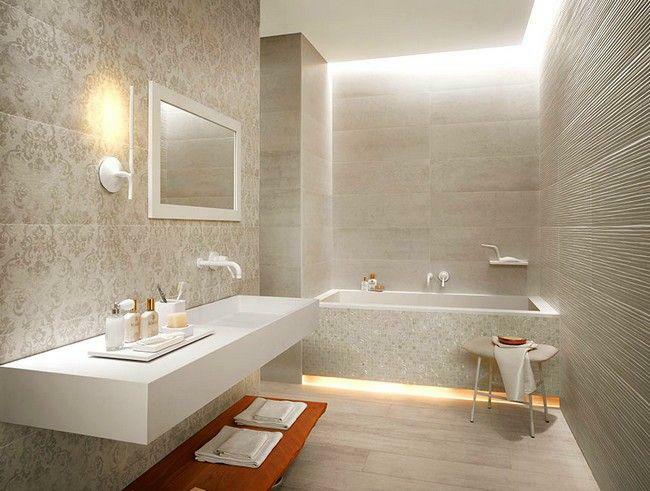 Simple, clean, and functional, this bathroom design is without frills or extras. The tub is a one-piece install, eliminating the need to tile the walls. There’s no shower glass. The toilet is a basic model costing less than $100 dollars, and the vanity is about $200. The mirror and light will be a very basic design. In this case, the floor is vinyl tile. This bathroom design can be created for about $3000 to $5000. For those who want to conserve costs but still add style to their bathroom remodel, choose good quality materials coordinated by the sales center to match aesthetically. This design includes tile and a glass enclosed shower, which raise the cost of materials and labor. The materials used in this bathroom design were available in a package for about $1850 including tax (tile not included). 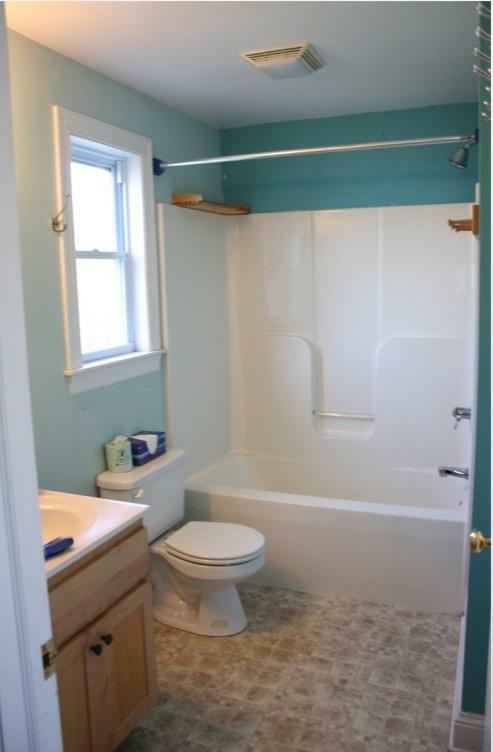 In total, the cost of a bathroom remodel like this one might fall between $6500 and $9500. Designer bathrooms are created with the help of a design firm. The quality of materials is higher, and the style is uniquely matched to the client’s taste. This guest bathroom has a contemporary, factory-made cabinet with a sink covering the full width of the top. The mirror is part of the set. This can save money over custom cabinetry, countertops, and mirrors. There’s a movable shower head, a standard pressure balance valve, and a tub spout. Cost of this bathroom remodel might depend upon factors such as whether fixtures are relocated and whether they are readily available. 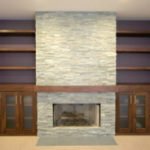 If mechanical items like lighting and plumbing have to move, or if custom cabinetry and countertops are selected, this will add to the remodeling budget. Guest bathrooms at this level can cost $15000-25000 and up. The bathroom pictured is probably in the $20K range. This level of bathroom is for clients who care more about aesthetics than cost. At least four different tiles adorn the walls, while recessed lighting nestles in the ceiling and under the tub. 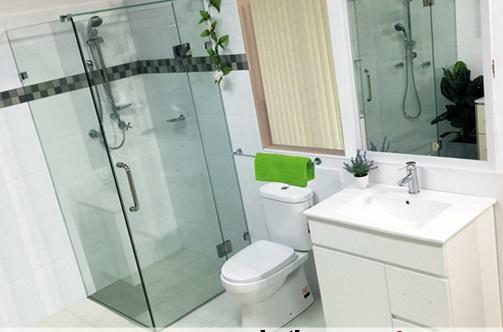 The fixtures and tiles are premium quality. Some features will require a level of expertise that not every contractor can provide. For instance, the mitered stone counter top requires hidden support embedded into the wall. Both the countertop and tub are custom, so the level of craftsmanship should be excellent. 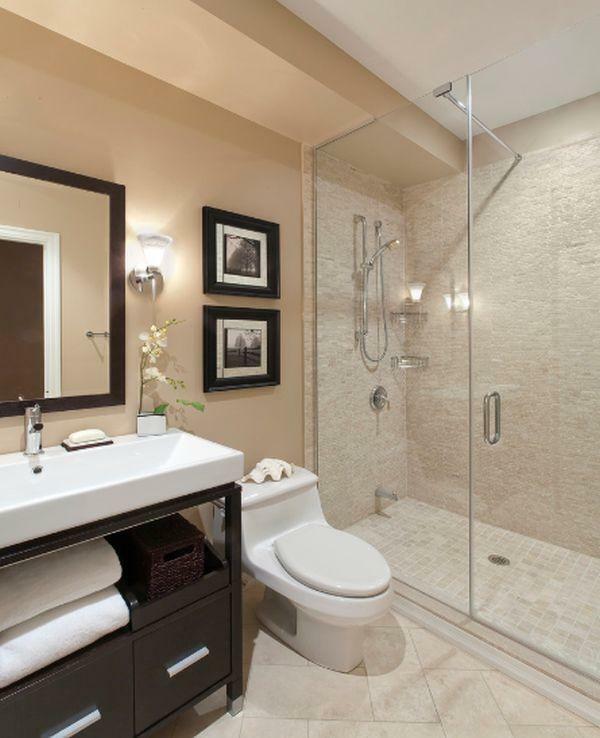 A guest bathroom done at this level would be $50 to 80K, plus the cost of the interior design – about $5 to 8K. The Golden Rule of Bathroom Design: the more things move, the more they cost. Some relocations in a high rise building may be extremely costly – or even impossible. For instance, it’s usually impossible to move a toilet location unless the plumbing is moved off the floor into a wall. Changing a light switch from one side of the door to the other might involve cutting and repairing 6 feet of drywall. Assume that everything that changes will add expense – and don’t be afraid to ask what that expense is while you plan your bathroom remodel.